This is a non sponsored review for COSME contact lenses purchased at REEL mall, Jing An district, Shanghai. January 2014 I had lasik eye surgery to correct my vision. Prior to that, I not only had bad vision, but I had astigmatism too which made buying and wearing contacts really troublesome. My eyes have totally healed since the surgery and I am now able to wear contact lenses for decorative purposes (0.0 prescription). This pair of lenses are created for 30 days of use. After which, they should be thrown away in order to prevent them from becoming too thin and tearing. The pack comes with two lenses (both with the same prescription). Of course if both eyes are not the same prescription, you'll need to purchase two boxes. The front and back is all in Chinese, but the information about the strength (prescription), expiration date and diameter are abbreviated in English. COSME contact's PLAY GIRL line comes in three colors: natural black, pinkish brown and grey green. I purchased the middle, pinkish brown lenses. The shop did not have sample lenses to try like they do at most optometrists in the USA, so I wasn't 100% sure the lenses would look good or even show up on my brown eyes. These contacts are very noticeable and tend to look a bit theatrical in some light. Indoors, the pinkish color is not as noticeable and the lenses just provide a cute dolly look. 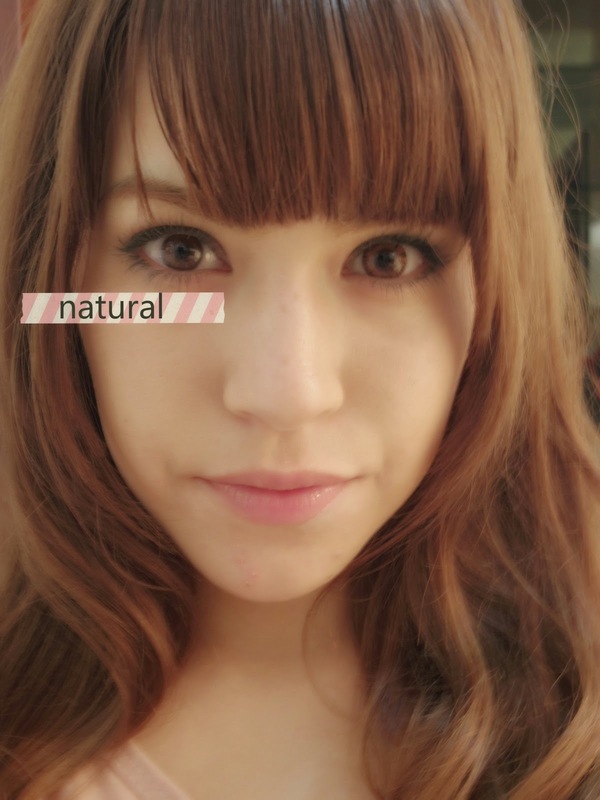 Here you can see a comparison of my natural eye on the left, and the contact lens on the right. You can clearly see even at diameter of 14.2, these lenses provide a nice dolly effect. They also brighten up my eyes up. These lenses are pretty comfortable but after about 4-5 hours of wear, I did notice my eyes were red and a little irritated. Overall, I really like these lenses, but I'm not in love with the color. I won't repurchase this color again, but I am happy with the brand and would like to try the other colors in this series. The lenses are the style im looking for! You look so pretty with them! thank you for the review!!! Hi Jessica, thanks for your comment! No, I did not have the surgery done in China. I got it done in the USA and it cost about 3,000$ for both eyes. I was pretty nervous during the procedure, but it was actually totally painless and was super quick. I think the most difficult/ scary part about it was the preparation before the surgery where the doctor used some instrument to hold open my eyelids. I really recommend lasik surgery for those with vision problems! I've met girls wearing contact lenses, and I admit that it makes them more attractive. My friend uses another brand though, I'm not sure if it is this brand, http://www.eo-executiveoptical.com/.